Flatbed printing uses UV inks which are cured into a solid film once exposed to wavelengths of UV light that tightly bonds directly onto a substrate. Additionally, flatbed printing provides the ability to print on multiple substrates that don’t need pre-preparation for size or shape beyond the parameters of the overall size of the bed. Environmentally, flatbed digital printing is more sustainable as it produces fewer waste cartridges and less indoor air pollution and since no printing plates or silkscreens need to be produced, flatbed printing allows shorter runs of signs to be produced more economically, too. The materials that can be used on a flatbed printer are virtually limitless, such as photographic paper, film, canvas, cloth, plastic, PVC, acrylic, carpet, tile, glass, ceramic, metal, wood, leather, and more. Gone are the days of not being able to print with white! 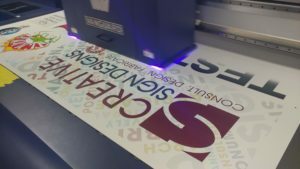 Its white ink capabilities provide the ability to create specialty applications and high-value, backlit graphics on any rigid or flexible media or object. Spot White Printing: With a flatbed printer, white can now be used as a spot color on any non-white substrate like colored paper, colored plastic, corrugated cardboard, glass, and metal. Flood White Printing: White ink can be printed using flood-fill data generated by the printer to cover the whole image area. Day/Night Flood White Printing: By using white as the diffusion layer while reverse printing the back side, flatbed printing provides the ability to achieve day/night backlit prints or a multi-layered effect on clear substrates. With flatbed printing, signage can be as authentic and unique as the businesses that select this method, including architectural elements where the possibilities are virtually endless as architects, designers, building owners, and communities can combine form and function. Energy-efficient flatbed printing provides the ability to incorporate more environmentally friendly products since the printers can print on virtually any material and requires fewer cartridges. Additionally, the inks used often contain fewer harmful chemicals and its light source is entirely ozone-free. With flatbed printing, business owners won’t have to worry about replacing signage as often as the ink is protected against the elements, preventing fading and cracking. Further, print times are reduced so business owners get higher quality in-house products quickly and accurately. If you’re ready to design and print signage limited only by your imagination, contact us today!